After missing the previous round to be introduced as a member of Puerto Rico’s Motocross of Nations team during last month’s Unadilla National Motocross, Ryan Sipes returned to action in the Kenda Full Gas Sprint Enduro Series with an overall win over Labor Day weekend at the Big Buck Sprint Enduro in Union, South Carolina. The Rockstar Energy/Leatt/Maxxis Husqvarna-backed Sipes won seven tests en route to his fifth overall victory of the season. Josh Strang finished outside the top five in seventh overall. In addition to winning all six of the Cross tests, Sipes won the first Enduro test of the weekend, which is a rare feat for the Kentucky rider, who is more at home on the faster tests. “The track was dusty at the start of the day on Saturday so I knew if I won the first Cross test it would make me the first rider out on the course for that first Enduro test, which gave me a big edge,” admitted Sipes. After the fourth test a hard rainstorm moved in over the area, leaving the course wet and slippery for the remainder of the day. Sipes went on to win Sunday’s event by 14 seconds over Tely Energy Racing’s Grant Baylor, with Coastal Racing Husqvarna’s Layne Michael, Tely Energy Racing’s Steward Baylor and Rockstar Energy Husqvarna’s Josh Strang rounding out the top five in a close formation. 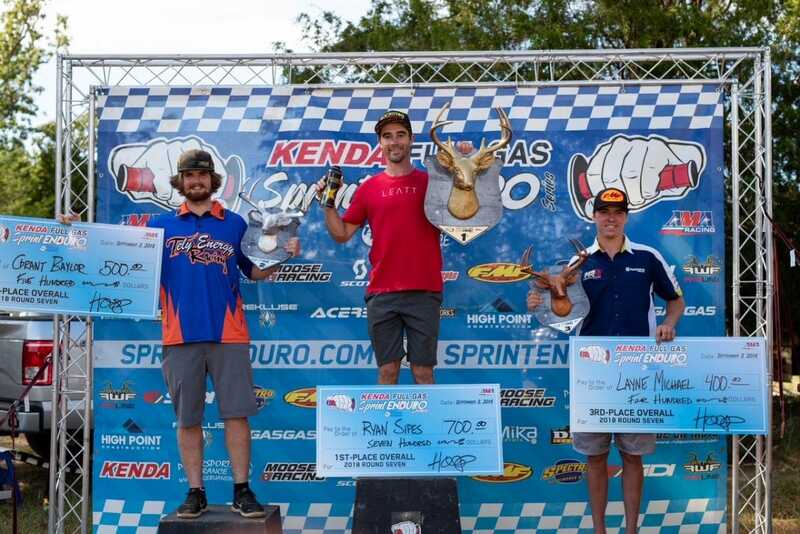 On Monday, Steward Baylor would get the win, followed by Michael, Grant Baylor, Sipes and SRT Racing Husqvarna’s Evan Smith, however the times were so close that Sipes still managed to take the overall win ahead of Grant. Grant Baylor edged Layne Michael by two seconds to claim the overall runner-up position. 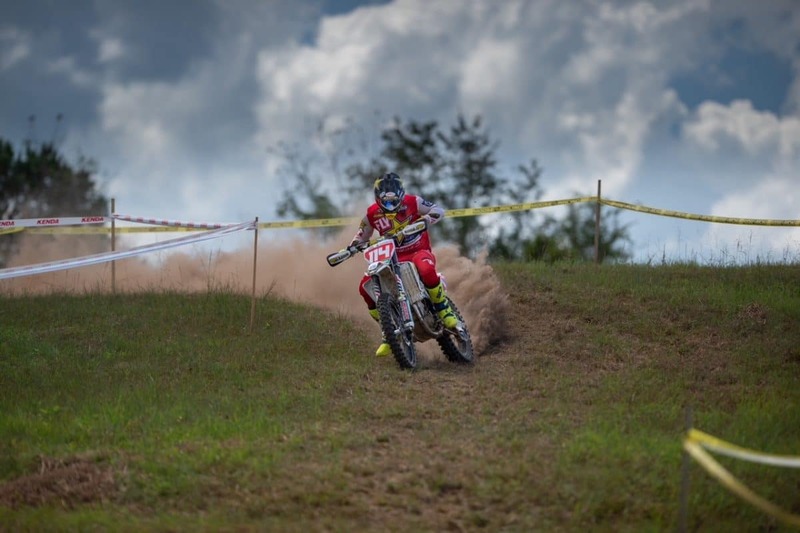 Grant won one of the Enduro tests on Sunday, but it was his consistency that landed him in the second position on the podium. Grant finished in the top three in eight of the 12 tests. Layne Michael has upped his game in 2018, and the Big Buck marked the Husqvarna rider’s second overall podium in a row. The North Carolina rider finished third in Sunday’s results and second in Monday’s results and managed to edge Steward Baylor for third overall by two seconds. Steward Baylor rode a 2019 KTM 450 SX for the first time at the Big Buck and managed to take four test wins, including all three Enduro tests on Sunday. The South Carolina rider threw on his 2018 suspension and said it took the first day of racing to get used to the setup. Steward re-took the points lead from Strang with his fourth overall finish. “Overall, I’m happy with the weekend and I liked the way the 2019 feels, but I needed more time on the bike,” said Steward. Evan Smith rounded out the top five on his SRT Racing Husqvarna. Smith was a minute off of Baylor’s total time and 30 seconds ahead of Beta USA’s Jordan Ashburn, who finished sixth. KR4/Husqvarna’s Tayla Jones won the Women’s Pro division by nearly two minutes over Bonanza Plumbing/Trail Jesters KTM rider Mackenzie Tricker. Jones won every test except for one, and Tricker won that one. Brooke Cosner finished third after recently switching to KTM. South Carolina’s Kendall LaFollette finished fourth.